We, the undersigned, as consumers with an abiding fondness for the striking, historic and uniquely Californian blue and orange ball-shaped Union 76 logo, be it on tall metal poles or car antennae (since 1967), hereby call on ConocoPhillips to reconsider their alteration of the 115-year-old brand, to cease replacing spherical blue and orange 76 balls at gas stations with flattened blue and red disks, and to restore the beloved spheres to the poles where they belong. If ConocoPhillips does not demonstrate greater respect for the the history and goodwill associated with the blue and orange 76 ball, we will be taking our business to other gas sellers. This petition is being launched on January 31, six days after ConocoPhillips posted fourth quarterly earnings of $3.7 Billion, and we call for a sincere response to our concerns before the announcement of their next second quarterly earnings. We had 76 balls in Ohio until Unocal withdrew. If ConocoPhilips continues its disregard for automotive history, I will not use their products, should I ever have occasion to be in their territory. Cp is just as bad as BP. BP took Sohio and Amoco away (and ARCO may disappear in the next few years). I support a boycott of CP if they don’t reverse themselves and keep the 76 balls. The 76 ball is an icon, and should be left alone. 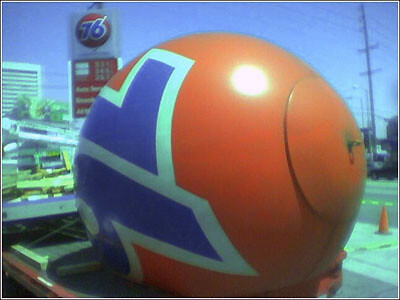 I live in England but know of the 76 ball, I drove around California for a few months last summer and they were a great sight. I love in London, UK. We have lost most of our red telephone boxes & red double decker buses in the name of progress. Our city is a poorer place for it – we should have hung on to our famous icons. The 76 balls have similiar status – keep them. When I think about my time in California, the 76 ball is a part of the landscape, especially on those long warm nights at Dodgers Stadium. People love it, and it only costs money to replace it….if it ain’t broke don’t fix it! Ray I’m sure has no use for 76 balls… however we in CA have a GREAT need to keep in place our own History. Please do not remove theses from the gas stations. Just because you have the power to do something does not always mean that you should. Be a part of this state. Be a GOOD part of this state and earn new loyalty from your current and future customers. Let the Union 76 Orange balls remain as the signage for the statuions and let Ray worry about his own ball problem. I can only echo what the earlier poster from London said, any bit of design that stand out as being a little bit different from the herd can only be a good thing. Why a company that has a logo that is as unique as this one would want to swap it for a plain boring usual sign that looks the same as everything else is beyond me. I also live in the UK and have seen icon upon icon disappear from everyday life! Why should some corporation or company dictate to the public what it thinks we want? The people have spoken! They want their balls back!! Our family owns two 76 stations in LA, and we want to save the balls too. People just love them. BIG OIL, on the other hand, wants to modernize the 76 image, despite our reservations, and wants to mess with a classic. Don’t give in to corporate pressure. You guys are really the heart and soul of the company and keepers of the flame. America wouldn’t get rid of Mt. Rushmore so why get rid of an icon like the 76 balls? From Richard in the Netherlands. Why does the antenna ball advertised for sale say 69 and not 76? Just a confused passer by. Keep the balls – I live in the UK and big business are all to quick to get rid of iconic items, Routemaster buses in London and red phone boxes are a thing of the past and we are the poorer for it. What is it with big corporations and their desire to makeover their brands?In this ever changing world,it is a comfort to have unchanging icons that have become part of our heritage…the London buses are a prime example,London won’t be the same without them.I have seen these balls whenever i have been Stateside and to me they are a part of the US road network as are the big posters boards and the green highway signs.For Pete’s sake,leave them alone! I worked for Union Oil for 32+ years. 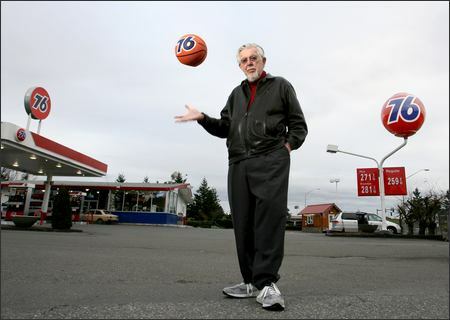 The 76 ball was the heart and soul of much of what we in marketing did. When Tosco bought 76 Refining and Marketing in 1997, one of the reasons for the purchase was the “strong 76 brand image”. When Phillips 66 bought Tosco, one of the reasons was the “strong 76 brand image”, which they made sure would transfer to them by licenses. When Conoco became Conoco Phillips, Conoco made sure that the 76 brand came with the purchase because of the “strong 76 brand image”. After they got the image, in my humble opinion, they have done everything possible to destroy the strong brand image. They discontinued their association with NASCAR, the Los Angeles Dodgers, and multiple other high profile and recognizable partnerships. I think this has less to do with good marketing than it has to do with somebody’s huge anti Union Oil ego. In my opinion, this is really a stupid, self destructive thing to do. As one of the other comments said “It’s their nickle”, but if it was my nickle, I would stay with what works, and that’s the 76 meatball. Thanks for letting me share my opinion.